Dr. Sears is a genius. No, not in an Albert Einstein or Pablo Picasso kind of way. He’s more of an Oprah or a Madonna kind of genius. He’s a genius because he has written a book that capitalizes on the vaccine-fearing, anti-establishment mood of the zeitgeist. The book tells parents what they desperately want to hear, and that has made it an overnight success. Dr. Robert Sears is perhaps one of the best-known pediatricians in the country. The youngest son of Dr. Bill Sears, the prolific parent book writer and creator of AskDrSears.com, Dr. Bob has become the bane of many a pediatrician’s existence. He has contributed to his family dynasty by co-authoring several books, adding content to the family website, and making myriad TV appearances to offer his sage advice. But Dr. Bob is best known for his best-selling The Vaccine Book: Making the Right Decision for your Child . This book, or at least notes from it, now accompanies many confused and concerned parents to the pediatrician’s office. Parents who have been misled by the onslaught of vaccine misinformation and fear-mongering feel comforted and supported by the advice of Dr. Sears, who assures parents that there is a safer, more sensible way to vaccinate. He wants parents to make their own “informed” decisions about whether or how to proceed with vaccinating their children, making sure to let them know that if they do choose to vaccinate, he knows the safest way to do it. And for $13.99 (paperback), he’ll share it with them. In the final chapter of his book (entitled “What should you do now?”), after reinforcing the common vaccine myths of the day, Dr. Sears presents his readers with “Dr. Bob’s Alternative Vaccine Schedule.” He places this side-by-side with the schedule recommended by the American Academy of Pediatrics and the CDC’s Advisory Committee on Immunization Practices. He then explains why his schedule is a safer choice for parents who chose to vaccinate their children. Without a doubt, the alternative vaccine schedule is among the more damaging aspects of this book. It’s the part that gets brought along to the pediatrician’s office and presented as the plan going forward for many parents today. But the book is also dangerous in the way in which it validates the pervasive myths that are currently scaring parents into making ill-informed decisions for their children. Dr. Sears discusses these now common parental concerns, but instead of countering them with sound science, he lets them stand on their own as valid. He points out that most doctors are ill-equipped to discuss vaccines with parents, being poorly trained in the science of vaccine risks and benefits. He then claims to be a newly self-taught vaccine expert, a laughable conceit given the degree to which he misunderstands the science he purports to have read, and in the way he downplays the true dangers of the vaccine-preventable diseases he discusses in his book. He then provides parents with what he views as rational alternatives to the recommended vaccination schedule, a schedule designed by the country’s true authorities on vaccinology, childhood infectious disease, and epidemiology. So what does Dr. Sears have to say, exactly, about the risks of vaccines, and just how out of touch is he with medical science and epidemiology? It is not uncommon for people to be confused about how public health measures relate to personal or individual health. With regard to vaccines, some feel that recommendations made “for the good of the public” may not necessarily be for the good of the individual. Some feel that while they may understand the rationale for vaccinating on a societal level, they are unwilling or afraid to place the burden of potential vaccine risks on their child. Dr. Sears falls for this line of thinking, and leads parents to believe that certain vaccines protect the community but not the individual child. He gives polio as an example, stating that the risk of polio is zero, and that therefore the vaccine does not protect the individual child from disease. This, of course, is untrue. While new cases of polio no longer arise in the United States (thanks to the success of the polio vaccine) they still do in other areas of the world. As is true for many infectious diseases, imported cases and potential outbreaks are a quick airplane flight away. The more unvaccinated children we have, the more likely an imported case will lead to larger outbreaks of disease. So yes, vaccinating protects the individual child as well as the community at large. Ironically, polio would likely have been eradicated from the earth by 2002 had it not been for the propagation of a vaccine myth. In the impoverished Indian state of Uttar Pradesh (which, in the year 2000, accounted for 68% of all polio cases in the world), a myth that the polio vaccination campaign was really a government conspiracy to sterilize children prevented that campaign from accomplishing its true mission of ridding the world of this horrible disease. Of course herd immunity, an epidemiological concept, is of vital importance to public health. We know that Dr. Sears understands at least this much, because he advises parents who fear giving their children the MMR vaccine not to tell their neighbors, lest too many parents develop similar fears. He warns that an increasing number of unvaccinated children will result in a resurgence of the disease. He couldn’t be more correct. Enlarging pockets of unimmunized and underimmunized children around the country have already resulted in outbreaks of disease. These vaccine-preventable outbreaks are just harbingers of worse outbreaks yet to come, should this trend continue. Throughout his book Dr. Sears highlights common parental concerns about vaccines. He follows these not with fact-based discussions, but with subtle (and often not so subtle) words of reinforcement. For example, Dr. Sears often downplays the potential danger of vaccine preventable diseases, or the risk of infection for the unimmunized child. Although the book is rife with such misinformation, I will limit my discussion to just a few examples to give a sense of the distortions involved. In truth, tetanus is not an infant disease…Also, diphtheria is virtually non-existent in the United States. So, one could create a logical argument that a baby could skip the tetanus and diphtheria shots for a few years and be just fine. Perhaps Dr. Sears is unaware that tetanus is indeed a disease of infants, and potentially of anyone. And to make the case that because diphtheria (or any infectious disease) is not endemic to the United States it is therefore not a threat to unimmunized children, betrays Dr. Sears’ naiveté when it comes to basic principles of epidemiology and infectious disease. Epidemiology and history has shown us that when vaccination rates drop sufficiently, outbreaks of seemingly vanquished diseases return with a vengeance. Diphtheria is no exception. In the newly independent states of the former Soviet Union, declining childhood and adult vaccination rates against diphtheria have played a major role in a massive epidemic of that deadly disease. And as we see more and more pockets of unvaccinated children around this country, we are beginning to see the reemergence of horrific vaccine preventable diseases. Recent outbreaks of invasive Hib disease and of measles should remind us how important it is to maintain our herd immunity against these scourges of the not-so-distant past. Of course, Dr. Sears never challenges the unsupported concerns about vaccine risks. He simply restates these concerns, and then adds fuel to the fire, supporting the irrational fears that led to this growing trend of underimmunization. The purpose of VAERS is to detect possible signals of adverse events associated with vaccines. Additional scientific investigations are almost always required to properly validate signals from VAERS and establish a cause and effect relationship between a vaccine and an adverse event. The risk that any one child will suffer a severe reaction over the entire, twelve-year vaccine schedule is about 1 in 2600. The risk of a child having a severe case of a vaccine-preventable disease is about 1 in 600 each year for all childhood diseases grouped together. Is vaccinating to protect against all these diseases worth the risk of side effects? That’s the million dollar question. Of course, the answer is so overwhelmingly “yes” that it’s difficult to conjure up the energy to respond to Dr. Sears’ misleading analysis. Not only does he start his statistical sleight-of-hand by inappropriately using VAERS data, he then calculates the risk of acquiring a vaccine preventable disease using current disease incidence rates. What he doesn’t acknowledge is that those rates are predicated on current vaccination rates. The reason a child today is at low risk for contracting these diseases is precisely because our vaccination rates are so high! HIB is a bad bug. Fortunately , it’s also a rare bug, so rare that I haven’t seen a single case in ten years…Since the disease is so rare, HIB isn’t the most critical vaccine. If parents follow the extremely dangerous, backwards logic of Dr. Sears, we are certain to see the incidence of vaccine-preventable diseases rise, as we are now just beginning to see in the US. Rest assured, it doesn’t take long for a disease to reemerge once vaccination rates drop. Usually not. Most cases, especially in children, pass within a week or so without any trouble. However, approximately 1 in 1000 cases is fatal…Now that measles is rare, many years go by without any fatalities. The possible complications of measles, mumps, or rubella are very similar to the side effect of the vaccines themselves. One in 1,000 cases of measles results in encephalitis, with a high rate of permanent neurological complications in those who survive. Approximately five percent develop pneumonia. The fatality rate is between one and three per 1,000 cases. Contrary to Dr. Sears’ statement, death is most commonly seen in infants with measles. Subacute sclerosing panencephalitis (SSPE) is a rare complication of measles infection that occurs years after the illness in approximately 10 of every 100,000 cases. It causes fever and a mild rash in 5-15% of recipients. 0.03% will have a febrile seizure – likely not a result of the vaccine itself, but simply a child’s individual predisposition to febrile seizures. One in 10,000 children will have a more serious event following the vaccine, such as a change in alertness, a drop in blood pressure, or a severe allergic reaction. Approximately 1 in 25,000 cases is associated with an asymptomatic drop in the blood platelet count, which quickly returns to normal without any consequences. Parents who have watched helplessly as their child develops neurological problems within weeks of being vaccinated will probably always be 100 percent convinced that the vaccine caused the problems. The fact that neurological complications are listed in the product inserts lends credibility to their case. I’m sure the truth of the matter is somewhere between causality and coincidence. Hopefully someday we will know for sure which side effects are truly vaccine related. Of course, we will never “know for sure” if every report of an extremely rare event following a vaccine is causally related or not. We continue to monitor trends and conduct rigorous surveillance, and follow that with sound epidemiological studies when concerns arise. This is why we can say, with good confidence, that these vaccines are extremely safe, and that Dr. Sears’ concerns and equivocations are misleading at best. Throughout his book, Dr. Sears discusses the common fears concerning vaccine dangers, never correcting when these fears are based on myth or misinformation. Rather, he presents them in a “we just don’t know enough” manner (even when we do), or as matters of fact (even when they’re not). Dr. Sears raises the concern in his book that the recommended schedule of childhood vaccines may pose a danger. He suggests that we just don’t know if the chemicals contained in the vaccines (which he lists in alarming fashion) may be too great of a burden for the developing child. In the very first page of the book’s preface, Dr. Sears tells his readers that he is “not going to discuss, at length, mercury or thimerosal in vaccines because, thankfully, these have been taken out of virtually all vaccines” (my emphasis). This is followed by more language that makes it clear he believes thimerosal was a dangerous additive, and that the little remaining thimerosal in the vaccine supply (contained in one form of the influenza vaccine) is still a risk. Of course, we know that the thimerosal in vaccines was unlikely to ever have been a danger to children, but Dr. Sears uses the same old misinterpretations of the science and conspiracy theories to arrive at the conclusion that it was. In fact, he point blank states that “vaccine manufacturers knew that we were overdosing babies with mercury, but no one in the medical community realized the possible implications for almost ten years.” This kind of fear mongering is no different than that spewed by the folks at Generation Rescue, and lacks any basis in science. In his section on vaccine ingredients, Dr. Sears (again, either naïvely or dishonestly) discusses the rise in the rate of autism diagnoses as possibly a result of thimerosal in vaccines. He cites the same tired and poor references (and an article from The LA Times ) we’ve heard before from the likes of Jenny McCarthy, and then asks “so who do we believe?” Again, that question is left hanging. Of particular concern to Dr. Sears is the potential dangers of aluminum, which has become his new post-thimerosal villain. Although he worries aloud in his book that “aluminum may end up being another thimerosal”, Dr. Sears is unaware that such a comparison doesn’t exactly strike fear in the hearts of the scientific community. Many vaccines contain aluminum as an adjuvant. An adjuvant is a substance that boosts the ability of a vaccine to induce an immune response. It acts locally at the site of injection, as a signal to the immune system, drawing a heightened response to the injected vaccine. Ironically, without adjuvants we would need a larger dose of the vaccine to induce an immune response. I doubt that would go over well in anti-vaccine circles. …some studies indicate that when too many aluminum-containing vaccines are given at once, toxic effects can occur. In fact, no such studies exist. He does correctly state that there is very little known about the pharmacokinetics of intramuscularly injected aluminum as it occurs in vaccine adjuvants, but he goes on to distort what we do know about aluminum toxicity into a rationale to fear our current vaccine supply and schedule. For instance, we know that aluminum has been blamed for producing neurotoxicity in some patients with renal failure on long-term dialysis, and in some extremely premature infants given prolonged courses of aluminum-containing intravenous nutritional solutions. But this is not comparable to the exposure of healthy infants to adjuvant-containing vaccines given intramuscularly on a few, discrete occurrences over a period of months. Similar to the way the safety data for methylmercury is often incorrectly applied to the ethylmercury in thimerosal (and incorrect inferences of toxicity made), Dr. Sears uses safety limits set for something else, and incorrectly applies them to the aluminum in vaccine adjuvants. Dr. Sears uses the FDA’s maximum permissible level (MPL) of aluminum for large volume bags of intravenous fluids given chronically to premature infants (25 µg/L), and extrapolates it to adjuvant-containing vaccines. He also uses the number 5 µg/kg/day as the amount of aluminum found to cause toxicity in some premature infants receiving intravenous feeding solutions that contain aluminum. What he doesn’t mention is that the 25 µg/L number comes from studies showing that this concentration produces no tissue aluminum loading, and that it was chosen to allow room for other exposures. In fact, it is estimated that the aluminum in these intravenous feeding solutions accounts for only 10-15% of the total parenteral aluminum intake per kg body weight that premature infants receive in a given day while in intensive care. The number was set low to leave room for the other sources of parenteral aluminum these infants receive. Still, Dr. Sears uses this number as his standard against which he compares the aluminum content of vaccines. This is misleading for a number of reasons. First, the 25 µg/L MPL for parenteral feeding bags says nothing about the maximum amount of aluminum that can be safely injected. This is obvious as the number is expressed as a concentration, not as an absolute amount of aluminum. The average premature infant would likely receive 100 ml/kg/day of solution, and therefore roughly 2.5-5 µg per day of aluminum from this source. Again, accounting for only about 10-15% of the parenteral aluminum the infant would receive in a given day. Dr. Sears does acknowledge that the number isn’t a maximum permissible amount of aluminum for injection, but he uses it anyway stating, in essence, that it’s all we’ve got. But it isn’t all we’ve got, as we shall see in a moment. The fact that these intravenous, aluminum-containing solutions are administered continuously over long periods of time, whereas vaccines are administered in discrete unit doses at intervals spaced out over time, is also not taken into consideration in Dr. Sears’ discussion. But his use of the FDA limits for intravenous feeding solutions is misleading also because it ignores the difference between intravenous and intramuscular or subcutaneous injection of aluminum, as in the case of vaccines. In fact, there is evidence, which Dr. Sears must have missed in his exhaustive review of the literature, that the aluminum from vaccines behaves differently than intravenously administered aluminum and that the body burden of aluminum from vaccines is not so concerning when placed in the context of the background body burden of aluminum. One piece of evidence that the aluminum in vaccines is handled by the body quite differently than the aluminum in intravenous solutions comes from studies looking at the intramuscular injection of aluminum-containing adjuvants into rabbits. Rather than entering the blood stream directly and accumulating in tissues, as with intravenously injected aluminum, intramuscularly injected aluminum-containing adjuvants are first dissolved by organic acids in the interstitial fluids, and are then rapidly eliminated. Another reassuring look at aluminum exposure from vaccines comes from an analysis by Keith, et al. from the ATSDR. They looked very closely at the way in which all sources of aluminum exposure in the infant contribute to the total body burden of aluminum, including inhalation, oral, dermal, and vaccine exposures. They took into consideration uptake, transfer from the blood, release from the injection site, distribution patterns, and retention and elimination rates of aluminum. They used the Priest formula to assess the fate of aluminum once it has entered the body via any route. While this leaves out the PCV and Hib vaccines, only one brand of Hib vaccine contains aluminum, and the PCV vaccine contains only 125 µg of aluminum. Thus, this analysis accounts for the bulk of the aluminum that comes from the vaccine series. As can be seen in the figure, aluminum spikes occur on the day of injection, followed by rapid elimination within a few days. 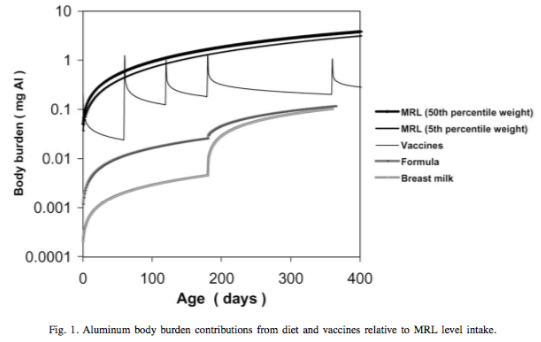 Despite slight and brief overlaps between the vaccine and MRL curves at the time of vaccination, the vaccine curves always fall between the dietary intake curves and the MRL curves. The authors conclude that, in the context of the overall body burden of aluminum with which infants are born and which is added to by ongoing oral, inhalational and parenteral sources, vaccines are likely to constitute only a minor, transient part. While there is good reason to be confident that the aluminum in vaccines is not the dreaded neurotoxin Dr. Sears fears it is, in his book he suggests otherwise. His mantra is that there are now so many vaccines in the routine schedule that we are overloading our children’s bodies with toxic aluminum. This is neither borne out by the science, nor is it likely given what we know about aluminum and the way in which children are exposed via vaccinations. In addition to the hot-button concerns discussed above, Dr. Sears highlights a number of other vaccine constituents that “might be of concern to some parents.” In typical style, he doesn’t explain why these concerns are unfounded, but instead makes sure they are listed in alarming fashion so that parents can make their own “informed” decision about whether or not to be concerned. Again, many parents appreciate this approach as one that is non-condescending. What it really is, however, is deceptively lacking in scientific honesty. I’m certain this list is frightening to some parents, but it needn’t be. Unfortunately, Dr. Sears does nothing to honestly inform his readers. I could not find information on injected formaldehyde. Fortunately, the amount in each vaccine is minuscule. Perhaps he could also have mentioned that formaldehyde is naturally present in the bodies of infants, at a level far greater than that contained in the vaccines they receive, and that formaldehyde does not appear to be carcinogenic to humans, or that animals injected with extremely large quantities of formaldehyde also fail to develop cancers. MSG – The controversial nature of MSG is reviewed, and readers are reminded that “large quantities” can cause nervous system damage “similar to Alzheimer’s disease.” Again, he follows this with the fact that vaccines contain only trace amounts of MSG. 2-Phenoxyphenol – The book informs us that this chemical causes reproductive defects, is an irritant, and can be found in nasty things like solvents. Again, Dr. Sears ends by stating that it’s found in “minuscule” amounts in vaccines. Sodium deoxycholate – Another toxic substance, harmful to the eyes and lungs, found in minuscule amounts in vaccines. Polysorbate 80 and 20, EDTA, Sodium borate, Octoxynol – For some reason these chemicals get a complete pass. Dr. Sears simply states that, in the tiny amounts found in vaccines, they are “considered harmless”. I’m not sure why these toxins are considered harmless in these trace amounts, while the others are not given this quick vote of confidence. Nor am I sure which authorities he is referring to who have made these declarations of harmlessness. Perhaps Dr. Sears is unaware that sodium borate is a chemical used in metal solder, as a laboratory buffer, has been banned as a food additive in Indonesia, and may cause liver cancer. And I’m surprised he didn’t mention that polysorbate 80 can increase the risk of blood clots, stroke, and heart attack. Perhaps he didn’t want to sound too alarmist. The final products of The Vaccine Book are the two schedules Dr. Sears proposes for different types of concerned parents. The ‘Selective Schedule” is offered to parents who “otherwise would have declined all vaccines”. For this schedule, Dr. Sears chooses vaccines he feels are the most important, because the diseases they protect against are either the most dangerous and/or the most common, and have the least severe potential side effects. The “Alternative Schedule” (the one I see most commonly) is intended for parents who want to vaccinate, but who have concerns about vaccine safety, a group he correctly describes as “growing in recent years as the media and the internet bring theoretical problems with vaccines to light.” This book, of course, is part of the mass-appeal stream of misinformation contributing to that growing trend. It spreads out vaccines to give only one aluminum-containing vaccine at a time. This is done so “infants can process the aluminum without it reaching toxic levels”. Really? Can Dr. Sears cite the references for this scientific sounding rationale? It exposes infants to the chemicals of only two vaccines at a time. Similar to the above anti-scientific rationale, this is done to spread out exposure to “chemicals”, so the infant can process them without risk. In a statement that clearly reveals his lack of scientific understanding, Dr. Sears then states, “…we don’t know whether this precaution is necessary, but it’s reasonable.” [Reasonable: 1 a: being in accordance with reason <a reasonable theory> b: not extreme or excessive <reasonable requests> c: moderate, fair <a reasonable chance> <a reasonable price> d: inexpensive 2 a: having the faculty of reason b: possessing sound judgment <a reasonable man>] No matter how you read it, reasonable it isn’t. It gives at most 2 vaccines at a time to limit potential side effects. Again, Dr. Sears states we don’t know if more simultaneous vaccinations leads to a greater likelihood of side effects, but concludes that it’s “a reasonable precaution.” We actually do know, contrary to very popular belief, that infants can easily handle all of the recommended vaccines, and then some. It begins with “the most important” vaccines. Dr. Sears would have his readers believe he has come up with a good schedule of vaccination based on giving vaccines that protect against the most serious diseases first. His readers would be better informed if they were told how the AAP/CDC recommended vaccine schedule is designed. How the country’s leading experts on vaccinology, infectious disease, and epidemiology determine which vaccines are most important and when they are best given – balancing when they are most effective at inducing an immune response and when the risk of disease and adverse disease outcome is greatest. Interestingly, the actual order of the real vaccine schedule is the same as Dr. Bob’s. “It delays shots for diseases that are usually fairly mild for infants”. He gives as examples hepatitis A and rubella. The first dose of both the hepatitis A and rubella vaccines are actually recommended at 12-15 months of age. They are not part of the vaccine series given in the first year of life. Further, Dr. Sears’ rationale for delaying rubella vaccine misses the point entirely. Rubella, while usually a mild illness, is not on the vaccine schedule because of the severity of the illness it causes. It is recommended because women infected (usually by children) during the first trimester of pregnancy, have a 50% chance of delivering a baby with severe congenital defects. The vaccine has been successful at nearly eliminated this horrific occurrence. “It delays the shots for diseases that a baby is extremely unlikely to catch during the first few years of life”. He gives as examples hepatitis B and polio. As I discussed earlier, this rationale uses flawed, backwards logic. Babies are at low risk for contracting polio because there is no home grown polio in this country. That is precisely because we vaccinate everyone in infancy. Without a susceptible host, the disease disappears. Unfortunately, because of religious opposition and other myths, the same cannot be said about every area of the world. As a result, we have yet to completely rein in this horrible disease.Although hepatitis B is not common in infancy as long as the infant’s mother is not a carrier (or infected) during pregnancy, it is still a risk. Prior to routine vaccination against hepatitis B, 18,000 children per year were infected. Half of these children did not contract it from their mother at the time of birth. Because the disease can be severe, chronic, and can lead to destruction of the liver or liver cancer, and because it can be spread through casual contact with contaminated objects like toothbrushes, it is recommended that all children get vaccinated as early as possible. Because the vaccine is so safe (it does not cause a hepatitis-like illness as Dr. Sears warns his readers), and it can be transmitted casually (it’s not just a sexually transmitted disease as Dr. Sear states), it is recommended during infancy. it’s probably okay to give the combination MMR booster at age 5, when a child’s immune system is more mature [my emphasis]. Splitting the MMR into separate components is thought by some researchers to decrease the risk of autism and other reactions, although medical science has not proven this to be so. I don’t know to whom he is referring when he writes “some researchers”. I do know (as should Dr. Sears) that there is not one shred of scientific support for the notion that a split MMR confers any benefit over the combination vaccine. It certainly can’t decrease the risk of autism, since the MMR does not cause autism. And there is no scientific evidence that it decreases the risk of any side effects. What it does do is increase the number of shots a child receives, increasing the time, expense, and pain involved. More importantly, it increases the amount of time a child is susceptible to disease. But the most damaging aspect of this kind of deceit is that it further erodes society’s understanding and trust in science. Tagging the statement, “although medical science has not proven this to be so” at the end, does nothing to exculpate him from this offense. After explaining his alternative schedule, Dr. Sears cavalierly remarks that if he’s wrong about all of this, the worst-case scenario is that “you risk really annoying your doctor because you’re trying to think outside the box.” I’ve just discussed the real harm of this schedule. Applying the positive expression “thinking outside the box” in an effort to cast a positive spin on it is disingenuous. Thinking outside the box can be a good thing in science. But, unless we’re talking about quantum theory, not as a way of understanding science itself. Dr. Sears claims to listen to parental concerns and to be impartial when it comes to whether or not, or how, to vaccinate. He says that, rather than tell them what to do, he prefers to give parents all the information they need to make their own, informed decisions. But instead of accurately discussing the science for concerned parents, correcting the pervasive vaccine myths and misinformation so prevalent in the media, on-line, and in our communities, he distorts, misinterprets, and misleads. Dr. Sears has either a very poor understanding of how to read the scientific literature, and of the scientific method itself, or he is intentionally misleading his readers. Either explanation indicates an unacceptable and egregious abuse of his public and professional responsibilities. Dr. Sears is not as blatantly anti-vaccine as others. In the beginning of the book he informs his readers that it “is not an anti-vaccine book” (his emphasis), and that other books over-emphasize the dangers of vaccines and do too much to scare parents. This is a nice set-up for the book, allowing parents to believe they are getting the straight, unbiased story from a doctor that really wants to inform. While Dr. Sears’ brand of fear-mongering is more subtle than some, it is at least as dangerous. Because of his family name and public persona, Dr. Bob has become one of the country’s most recognized pediatricians. And his plain language “parents know best” philosophy has attracted the admiration and trust of parents looking for authoritative validation of their fears, concerns, and beliefs. Unfortunately, Dr. Sears is good at repeating and reinforcing common parental fears and anti-vaccine myths, but is quite poor at reading the literature and understanding epidemiology. While he doesn’t overtly tell parents not to vaccinate, he certainly stacks the deck this way. In his discussion of each vaccine, his “reasons to vaccinate” section tends to downplay the risks of the disease. He “balances” this with a section called “reasons some parents choose not to vaccinate“. But I view this as simply his attempt to exculpate himself for being, in reality, an anti-vaccine spokesperson. For all intents and purposes, this gives parents every reason to feel confident that their rationale for not vaccinating is supported by sound reasoning. Dr. Sears rehashes and lends credence to the same debunked myths that have led to these parental fears in the first place, all under the guise of providing parents with “both sides” of the issue. Of course what he does is provide bits and pieces of good information alongside inaccurate and incorrect information, and asks parents to make an “informed” opinion. With his best-selling book (it currently ranks at #414 on Amazon) Dr. Bob, along with a growing platoon of other prominent anti-vaccine spokespeople, is leading parents into a trap that not only threatens their own children’s health, but the health of the entire nation as well. Already, this anti-scientific groupthink has increased the number of children who are under or un-vaccinated, and has resulted in preventable death and disease. I hold Dr. Sears and the many vocal prophets of doom (like Jenny McCarthy, Paul Kirby, Robert Kennedy Jr., JB Handley, and Andrew Wakefield) personally responsible for the increasing prevalence of parental vaccine refusal and the ensuing return of vaccine preventable disease.